The worldwide leader in digital consumer electronics and information technology, Samsung has announced the launch of its new portable DVD writer – TruDirect SE-T084M/RSWD. It’s the external slim, slot-in drive which allows consumers to burn digital content through a PC directly to DVD without the need of a hard drive for caching files, thanks to Samsung’s revolutionary TruDirect technology. 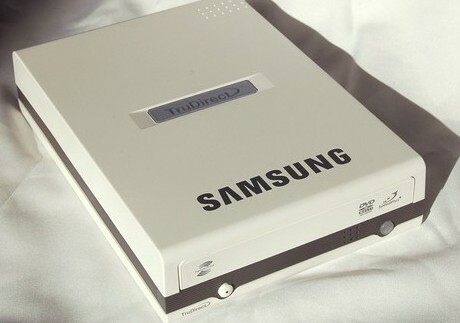 Samsung claims that the TruDirect SE-T084M is able to create a DVD of 1 hour HDD camcorder data files (approximately 4.1GB) in just 30 minutes, enabling real-time, fast and simple recording of your valuable videos, photos or data files onto DVD discs. In addition to fast and easy DVD title creation, this portable TruDirect drive also features fastest speeds of an optical disc drive on the market today, including 8X DVD+R and DVD-R writing, 6X DVD+R and -R Dual Layer writing, and 5X DVD-RAM writing. “Samsung offers consumers best-of-breed technologies and the new TruDirect SE-T084M continues to lead the pack in ODD innovation. With its slim and light portable design, the TruDirect SE-T084M lets users easily create DVDs more quickly and conveniently than ever before,” said Richard Aguilera, national sales manager, Samsung Storage Division. The new Samsung TruDirect SE-T084M external DVD burner is expected to hit the market in coming July 2008 for $149.